Not long after the adoption of the U.S. 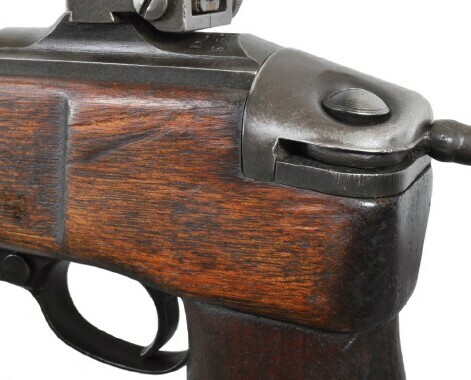 Caliber .30 Carbine, Model M1, the need for a shorter version for use by paratroopers became evident. Early in 1942 U.S. Army Ordnance issued a request for submissions of designs for a shorter version utilizing a folding or collapsible stock. The Inland Division of General Motors submitted their first drawings for such a design during March 1942. Submissions by two other sources were found to be unacceptable. Revised Inland drawings were recommended for standardization as the Model M1A1 on 29 Apr 1942. The design was approved 12 May 1942. A patent application for the design was submitted 05 Aug 1942 and granted Patent# 2,405,758 13 Aug 1946. 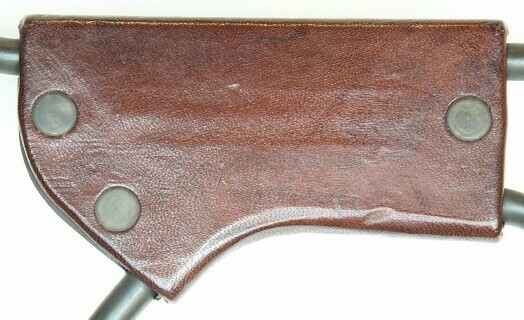 The Inland design was simply a side-folding stock any carbine action could be placed into, in lieu of the full length stock of the Model M1 Carbine. 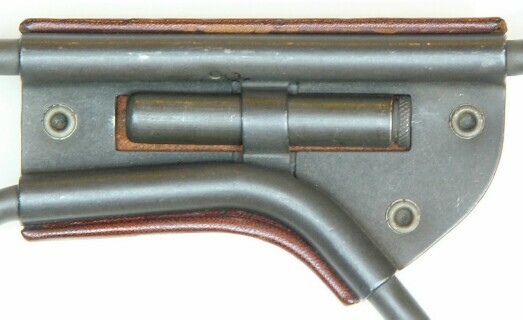 The markings on the carbine receiver remained the same as those of the Model M1. No markings identifying the Model M1 from the Model M1A1 were added or changed anywhere on the carbine or its parts. ALL Model M1A1 Carbines made during WWII were carbine actions manufactured by Inland and placed into M1A1 stocks manufactured by Inland's subcontractors. During the ongoing production of the Model M1 Carbines, M1A1 carbines were made by placing a complete M1 action into an M1A1 folding stock instead of the regular M1 stock. Serial numbers were whatever Inland serial numbers reached the assembly point at the time the stock was added. Whereas the features of the carbines that went into the stocks varied significantly over time and are still a subject open to some degree of debate, the M1A1 stocks were made in far fewer numbers with far fewer variations during a shorter period of time. This section will focus on the chronology of M1A1 stock production with a general description of the carbines placed within the stock variations. 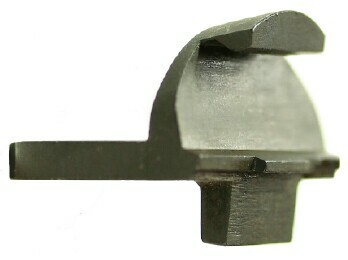 The individual stock parts are described in further detail in the Parts Section below. the first three producing M1A1 stocks that were predictably consistent. * Documents from Overton, Inland and U.S. Army Ordnance have conflicted with one another in regards to monthly M1A1 production and deliveries during WWII. The months and quantities presented on this page are best estimates based on reviews and evaluations of all available documents, interviews and experiences. Inland subcontracted S.E. Overton of South Haven, MI, for the manufacture of all of their M1A1 stocks. 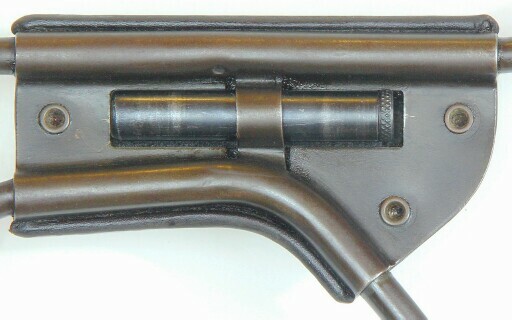 For the first run, Overton manufactured the forestock and grip. Royal Typewriter Inc. of Hartford, CT, was subcontracted to manufacture all of the hardware, receive the wood components from Overton, then assemble and return the completed stocks to Overton. Rivets used on the first run were semi-tubular brass. The face of the rivet was often darkened with paint. Overton inspected the finished stocks and forwarded them on to Inland. Ordnance acceptance marks in the form of the Ordnance crossed cannons were not added until after the stock was added to the carbine and the completed carbine passed a final Ordnance inspection. As with other carbine parts, a percentage of M1A1 stocks and parts were produced as replacements. These would not have had the Ordnance crossed cannons of the first production run. M1A1 Carbine Assembly: Inland Mfg. 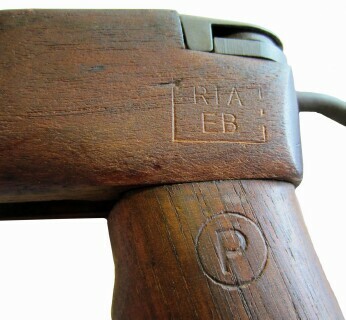 Serial numbers of the Inland M1 carbine actions made during this period ranged from 70,000 - 950,000, and many of these actions were put into M1A1 stocks. Consistent features of the carbines in this range included a two-rivet handguard, narrow barrel band, flip rear sight, and push-button safety. The M1A1 stocks and parts left over from the first run at S.E. Overton and Royal Typewriter were used and intermingled with stocks and parts manufactured during the second production run until the inventory of the earlier parts ran out. Again, Overton manufactured the forestock. 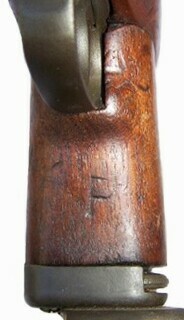 Initially Overton also made the hand grips but due to their workload and the complexity of manufacturing the hand grip, Overton subcontracted the J.S. Richardson Companies of Sheboygan Falls, WI, to manufacture the hand grip. Poor quality control at Royal Typewriter prompted Overton to cancel their contract by May 1944. Overton purchased all of Royal Typewriter's equipment and inventory related to the M1A1 stock and relocated it to the Overton facility in Michigan. Royal Typewriter's inventory was sufficient to sustain the needs of Overton until the end of production, although Overton had to spend time and money to insure that the items manufactured by Royal Typewriter met Ordnance standards. Overton handled final assembly and inspection of the M1A1 stocks. Rivets used during this time period were brass and later steel. Both were semi-tubular and were rolled over the plate on the inside. A few solid steel rivets have been observed. Brass rivets were often darkened with paint, and steel rivets were Parkerized. Overton inspected the finished stocks and then forwarded them on to Inland. Ordnance approval marks in the form of the Ordnance crossed cannons were not added until after the stock was added to a carbine and the completed carbine passed a final Ordnance inspection. As with other carbine parts, a percentage of M1A1 stocks and parts were produced as replacements. These spares would not have had the Ordnance crossed cannons. The last shipment of M1A1 stocks made by Overton (4,529) was shipped to Inland in January 1945, a month after Inland had completed it's second run of M1A1 Carbines (December 1944). March 25, 1938 to July 1, 1944.
do not agree with these months and quantities. With the completion of their M1A1 parts contracts, in November 1944 J.S. Richardson sold 8,000 M1A1 grips to Springfield Armory. In December 1944 J.S. Richardson sold all of their M1A1 tooling and custom machinery to Springfield Armory. Since Inland completed their second run production of the M1A1 in December 1944, it's likely the additional M1A1 stocks and parts at Overton and Inland were at some point also forwarded to Springfield Armory. The M1 Carbine, A Revolution in Gunstocking, a book by Grafton & Barbara Cook, states that Springfield Armory manufactured 3,535 M1A1 stocks in 1945 and 3,773 in 1946 with no M1A1 stocks produced thereafter. of grip is often difficult to see. 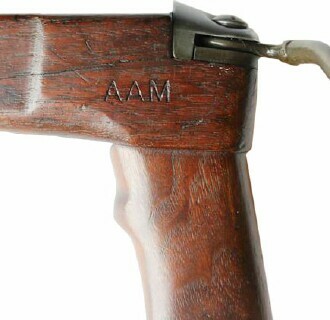 During WWII the M1A1 stocks and parts in the possession of Springfield Armory, whether made by Springfield or another manufacturer, were for use as replacements. No information has been found as to how many of these parts were actually placed on carbines prior to the end of WWII, or as to whether any of these carbines with replaced parts were used late in the war. A number of authors have concluded that these parts were used post-WWII only. Also, some thought no barrel bands with bayonet lugs or M2 Carbines were used during WWII. Evidence has been found to prove both saw limited use in combat in 1945. Inspect and Rebuild operations by or under the direction of U.S. Army Ordnance that included Springfield Armory will be covered in the next section below. One of the functions carried out by personnel at Springfield Armory was the packaging/preservation of replacement parts for the carbines. Packages with these parts have been dwindling over time but are still in existence well into the 21st Century. One such parcel was located containing seven packs of eight M1A1 hand grips each. The packs were dated January 20, 1945 thru April 27, 1945. Markings on the bottom of each grip were either SA or P-SC. The grips marked PS-C had been noted prior but these packs were the first to establish their authenticity as genuine M1A1 grips. While no evidence has yet to be located to identify who manufactured the grips. No evidence has been found as to whether Springfield Armory manufactured or contracted someone else to manufacture the forestocks they used in the assembly of M1A1 stocks. Ordnance contracts for parts routinely included a percentage of extras to be furnished for use as replacements. Thus, it would seem that Inland would have furnished some spare M1A1 stocks, in addition to the 140,000 they used in the assembly of their M1A1 carbines. Records at Overton indicated they manufactured 239,747 M1A1 stocks, which is significantly more than used by Inland and the normal percentages to be furnished as replacements. 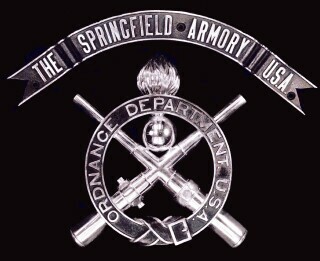 While it is not known whether Ordnance contracted Overton to produce a large quantity of extras for use by Springfield Armory, it is obvious that the quantities manufactured by S.E. Overton were more than sufficient to meet the total needed for Inland's M1A1 carbines, a percentage for use as replacement parts, and the M1A1 stocks assembled by Springfield Armory. The only manufacture marks observed on forestocks are OI (IO), indicating they were manufactured by Overton for Inland. Therefore, it seems possible that Ordnance might have contracted with Inland to furnish a large quantity of M1A1 stocks in addition to the standard percentage of spare parts. Early plans for Springfield Armory to take over the carbine program initially included plans for Springfield Armory to manufacture carbines. As the war and time progressed, the plans to manufacture carbines were dropped. It is possible that some or all of the spare parts manufactured for use as replacements might have been assembled into complete M1A1 stocks by Springfield or other facilities. Inspect and repair operations were ongoing throughout WWII and afterwards by Ordnance field personnel. Repair operations in the field were limited to parts on hand. Field rebuild operations were limited in scope and also limited by the availability of parts. Massive Inspect and Rebuild Operations under the management of U.S. Army Ordnance are known to have occurred post WWII and again at some facilities after the War in Korea. The exact dates of these operations at the various stateside facilities are not known. 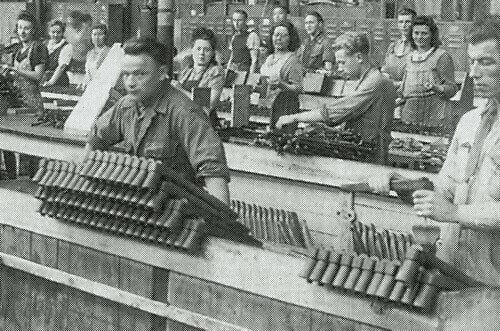 Ordnance contracted for Inspect and Rebuild operations to be done outside the United States as early as June 6, 1945 at Fabrique Nationale in Belgium, where it continued until June 23, 1946. Howa Machinery in Nagoya, Japan was also contracted from approximately 1947-1949. Ordnance directions for these operations called for complete disassembly of each carbine (M1A1 stocks included), after which the parts were forwarded to inspection stations specific to the parts. Some parts were upgraded, some passed inspection, some were replaced, and some were refinished. Rotary safeties, adjustable rear sights, and barrel bands with bayonet lugs were standard Ordnance upgrades for all carbines. When the parts met Ordnance specifications they were forwarded to a reassembly station from which carbines were rebuilt without regard as to who manufactured which part. Carbines were reassembled into M1A1 stocks without regard as to who originally made the receivers. The degree to which this happened varied, depending on a number of factors that included the availability of replacement parts and deadlines that were sometimes altered to expedite the operations. Many M1A1 carbines that went into these operations came out with M1 stocks due to a lack of replacement parts and because there was no attempt to put an action into its original stock type. Companies outside the continental United States contracted for Ordnance Inspect and Rebuild operations were prohibited from placing any marks on the small arms they serviced. Rebuild markings and the arsenals and armories they represent are covered in further detail on the page devoted to Post WWII Ordnance Operations. Rivets used during the Inspect and Rebuild operations were brass. Some were marked 7/4 on their face. The rivets were semi-tubular and rolled over the plate on the inside. At least one facility contracted by Ordnance outside the USA (FN) is known to have used rivets obtained locally. During and after WWII, any M1A1 needing service or repair at any point in time may have been serviced by U.S. Ordnance field personnel anywhere in the world. The parts used depended on the availability of replacement parts. Absent replacement parts, the carbine was simply placed into a full sized stock as a Model M1 or possibly a Model M2 conversion. While the M1A1 was not built as a select-fire carbine, GI's have long been known for a variety of field expedient conversions of various types. Specialized units with special needs had the ability to modify weapons to meet their needs. During the Korean War, a number of M1A1's were converted to select fire capability and unofficially referred to as M2A1's. During WWII U.S. M1A1 Carbines were supplied to allies under the Lend-Lease Program and dropped to resistance fighters in Europe by the Office of Strategic Services (O.S.S.) and their British counterpart, the Special Operations Executive (S.O.E.). Post WWII the Military Assistance Program provided M1, M1A1 and M2 Carbines to many nations as military assistance. Replacement parts were often included. A number of nations utilized local sources for replacement parts (Greece is known to have made forestocks and used post-war M1A1 buttplates having the part number followed by a circled P...see parts below). Police departments throughout the world have used M1A1's, including the Detroit Police Department during the 1960's. Replacement parts were sometimes obtained by cannibalizing existing stocks. The Model M1A1 Carbine has been one of the most highly sought U.S. Carbines since WWII. The limited number of originals manufactured, their attrition due to losses and use during and since WWII, and their high demand by many collectors willing to pay top dollar have made most unaffordable to the average shooter. 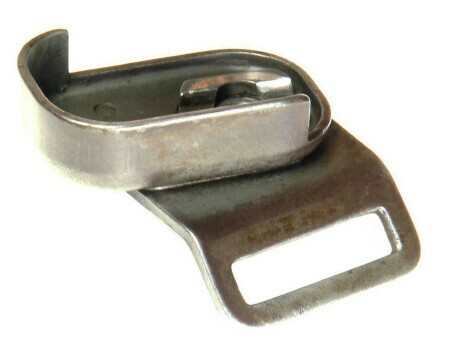 Since the mid 1950's a number of private commercial companies have manufactured a variety of replacement parts that appear similar to the originals. Several companies have produced after-market M1A1 stocks that are now widely available. A number of companies have produced commercial versions of the M1A1 Carbine, including Auto-Ordnance (Kahr Arms), Fulton Armory and James River Armory (under the trade name "RockOla Firearms"). Additional companies have produced M1A1 airsoft and/or air rifles, and some have produced non-firing replica M1A1 Carbines (Denix of Spain). Reconstructions using original parts with after market parts have become common. Some are sold as what they are, and some are represented as all authentic (intentionally or unintentionally). 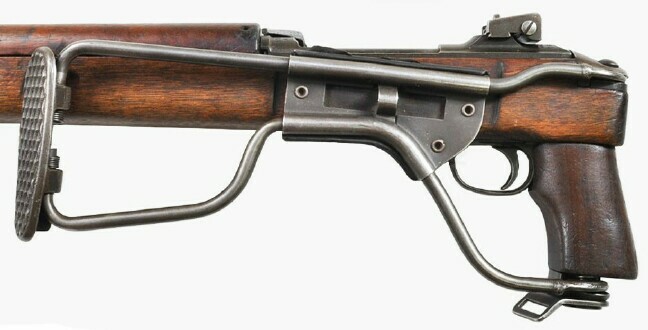 Fortunately, the original M1A1 stocks have a number of unique features that have not been replicated accurately. 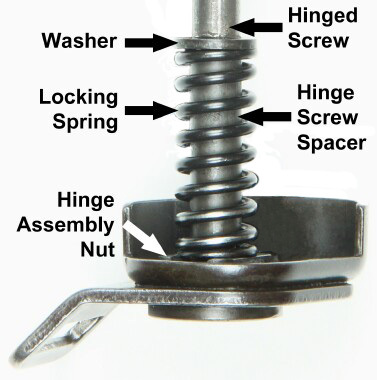 These features are included in the parts section that follows. Buyers would do well to get to know these features along with historical data provided above. subjected to a stateside U.S. Ordnance inspect and rebuild program. was on a carbine subjected to a stateside U.S. Ordnance inspect and rebuild program. Inset for tubular stock was milled, leaving pronounced edges as opposed to smooth curves (white arrows). at rear of slide channel cut, just forward of cross support. 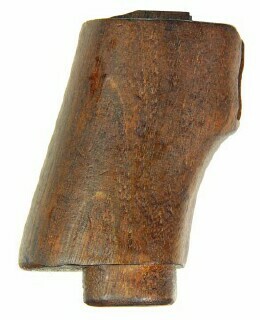 Bottom of hand grips were often rough and unfinished making markings difficult to see. This area was often smoothed by repeated folding of the tubular stock, removing part or all of any markings. Walnut Lumber of Kansas City, KS, a WWII subcontractor for stock manufacturer Sprague & Carlton of Keene, NH. 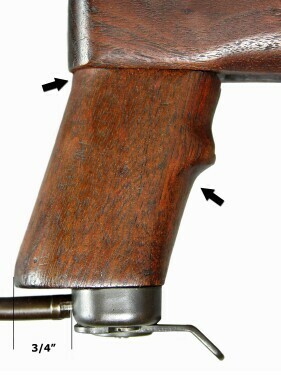 Information from The M1 Carbine, A Revolution in Gunstocking by Grafton & Barbara Cook indicates some late manufactured grips were made from mahogany. U.S. Ordnance Acceptance Marks were for completely assembled M1A1 Carbines that passed final inspection. Replacement parts, M1A1 stocks absent a carbine, and M1A1 Carbines assembled that were not inspected by U.S. Ordnance did not receive these marks. Manufacture markings and Ordnance crossed cannons have intentionally been omitted from this web page. Dies for replicating these marks are widely available but authentic parts had variations in fonts, size, location, etc. that we do not wish to share to educate those who seek to accurately replicate them. For questions regarding authentic manufacturer and Ordnance marks please post your queries with pictures on one of the Carbine Discussion Forums indicated at the bottom of this page. onto the ends that attached to the Hinge Screw. The Tubing, Lock, Hinge and their weld were then case hardened and parkerized. 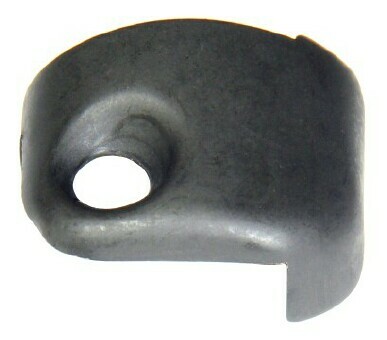 The top extension tube includes a detent (arrow) for proper positioning of the Cheek Rest Plates. 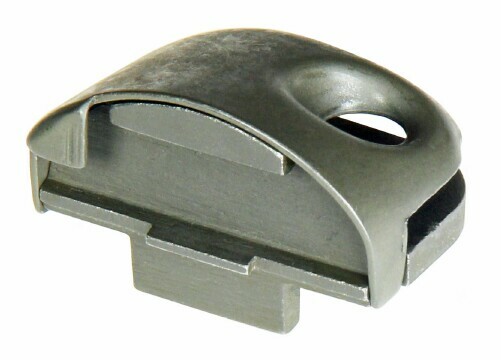 solid metal Lock and Hinge pieces are consistent in appearance on all GI bar extensions. The color of the parkerized welds should match the tubes and end pieces. Together the Cheek Rest Plate and Cheek Rest Cover Retaining Plate served as a mount for the leather cheek piece and strengthened the stock tubing extension. The plates were placed over either side of the center of the tubing extension. 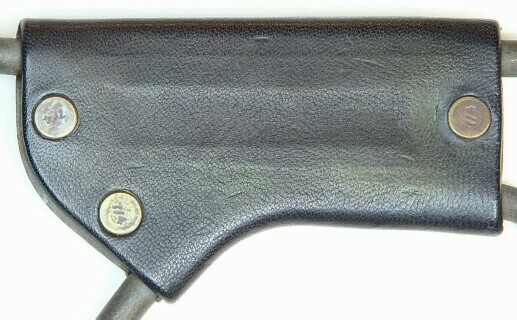 The leather cheek piece was placed over the Cheek Rest Plate. Rivets were placed through holes in the leather, Cheek Rest Plate and Cheek Rest Cover Retaining Plate then peened to secure the three pieces to the tubing extension. Neither plate has a manufacturers mark. Both were parkerized the same as the extension tubes. 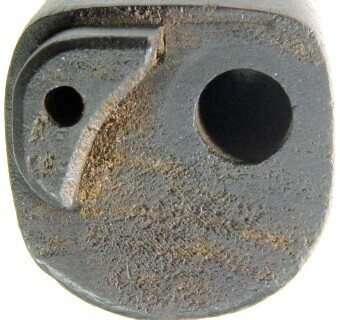 The black arrow indicates the location of the nub that mates to the indent in the upper tube for proper placement of the plates. The width and height of the openings to either side of the oiler retention piece (white arrows) are worth examination. They're size was consistent throughout production. The width and height of these openings can vary with reproductions. The Leather Cheekpiece was constructed from smooth or very lightly textured cowhide having a thickness of 2-3 oz. 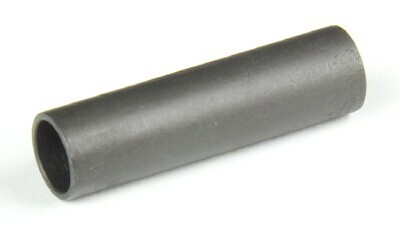 (1/32"-3/64"). The leather was dyed medium to dark brown or black. The leather covered the entire exterior surface of the Cheek Rest Plate wrapping over its edges. The leather was secured by pressure exerted on the edges of the leather when the Cheek Rest Cover Retaining Plate was secured to the Cheek Rest Plate with rivets. The fit of the leather between the plates left no visible gaps, folds or binding. 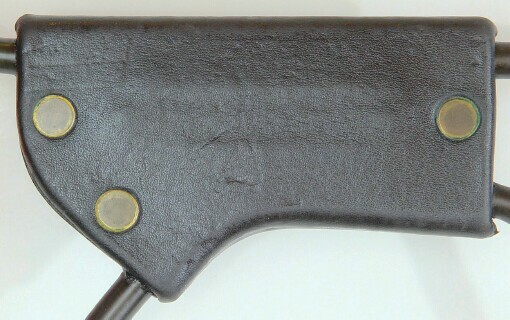 A unique feature of all M1A1 cheek rests was the head of each rivet was inset into the leather and sat flush with the surface of the leather. None of the head protruded beyond the surface of the leather. Rivets were automotive brake shoe rivets with a solid head having a diameter of 3/8" that tapered sharply to a shank diameter of .191"-.010". The overall length of the rivets was 9/32". The majority of rivets used on the M1A1's were semi-tubular having a hole 3/16" deep in the rear of the shank. Solid rivets have been occasionally observed but were rare. When the shank of each rivet was peened it rolled over the rivet hole forming the shape of a donut, not flattened. 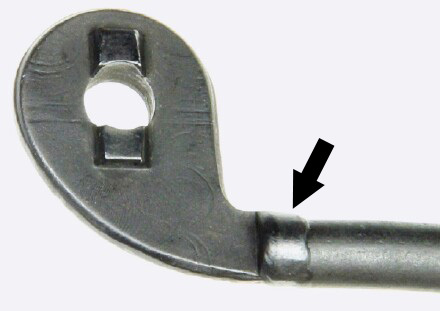 Semi-tubular rivets have a donut "hole" that is absent with solid rivets. Rivets during the period of Inland's first production run were brass. Brass rivets were common throughout production. During Inland's second production run steel rivets were also used. The heads of brass rivets were commonly painted black, steel rivets were parkerized. The black paint was commonly obliterated with use and time. Brass rivets marked 7/4 on the head were used during inspect and rebuild operations. 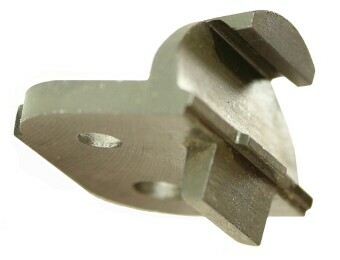 The 7 indicated a head diameter of 3/8", the 4 indicates an overall shank length of 4/16". 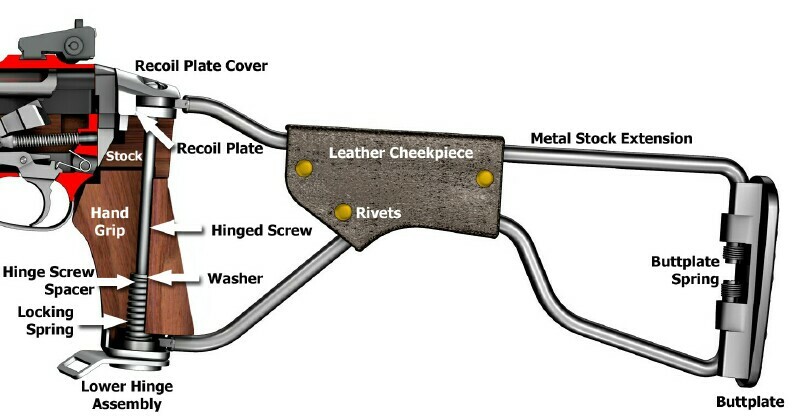 At any point in the life of an M1A1 stock, if the M1A1 buttplate, metal extension bar(s) or leather cheekpiece required replacement it was necessary to remove the rivets and cheek plates. Reassembly required the use of new rivets. 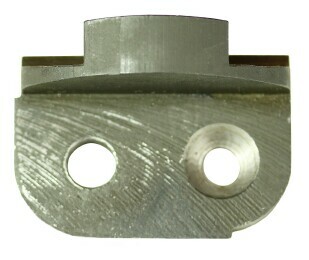 The M1A1 Recoil Plate was machined from solid steel and parkerized. It has no manufacturers mark. The Recoil Plate Cover was made from sheet metal and parkerized. It has no manufacturers mark. screw extended only .870" into the handgrip. 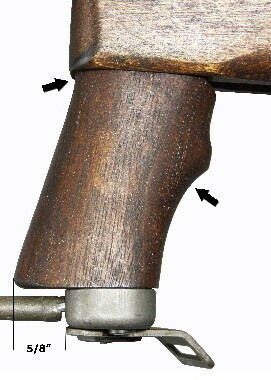 When pressure was applied to the handgrip it tended to crack due to lack of support. 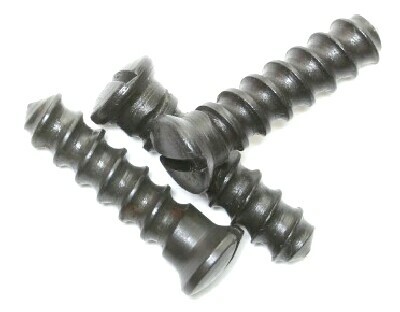 The vast majority of wood grip screws were 2.75" in length with threads 1.80" in length. The threads engaged both the handgrip and forestock. 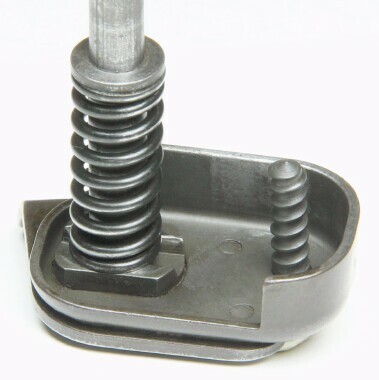 so that the screw head sat flush with the top of the recoil plate with no lateral movement when the screw was fully inserted. 3.15" from the top for proper positioning of the Washer. Hinge Screws were parkerized and unmarked. 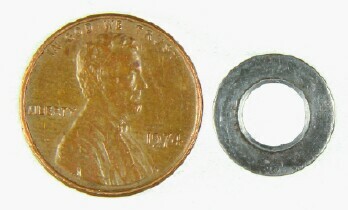 Washers were .505" in diameter and .062" thick. The center hole was .254" in diameter. They were unfinished and unmarked. 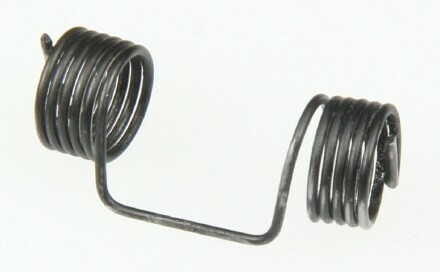 The Locking Spring was 1.310" in overall unassembled length with 9 coils in a right hand twist having an outside diameter of .50". parts are usually not interchangeable with their commercial equivalents. 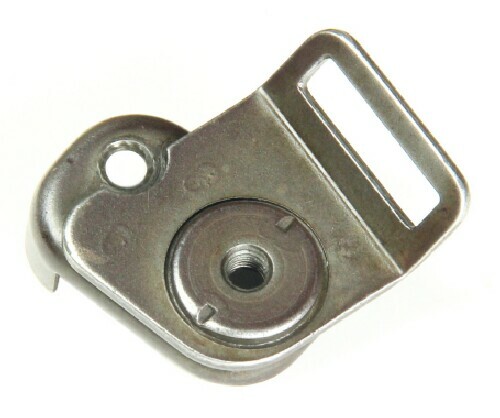 The Lower Hinge Assembly was one unit assembled using three separate parts: the Lower Hinge Shell, Rear Sling Eyelet and Lower Hinge Nut. to one another helps to identify them from their commercial counterparts. 1 1/32" wide and 1/4" deep with slightly rounded inner edges. 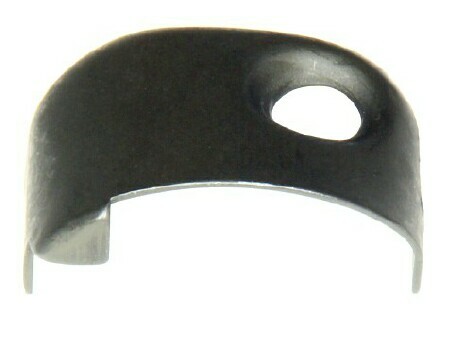 the Rear Sling Eyelet from rotating. On the inside of the Lower Hinge Shell these holes appear as circles. On the bottom of the Rear Sling Eyelet these are oval in shape (see pics above and below). 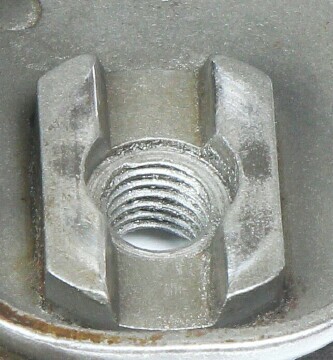 the walls on the inside of the nut. Commercial replicas are absent this feature. 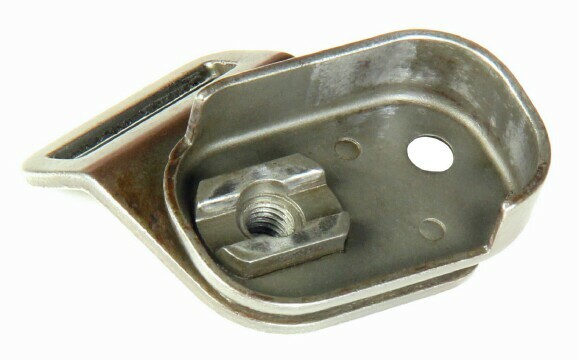 The lower half of the Lower Hinge Nut has 2 short bullet shaped spanner wrench notches. unscrupulous people have attempted to replicate these notches. 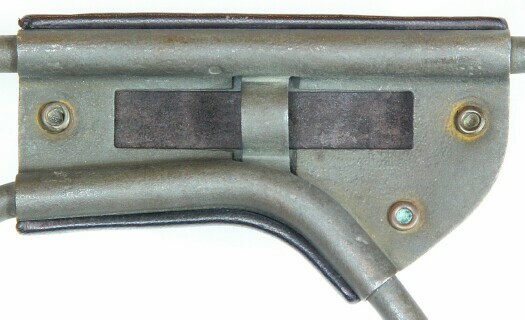 The Lower Hinge Screw of the M1A1 stock is the buttplate screw of the M1/M2 stocks. coil the wire made a 70 degree turn stopping at the outer diameter of the coil. These ends engaged slots in the tubes that held the spring in place. Between the two coils the .036 diameter wire was straightened approximately .66" to engage the buttplate to place tension on the spring. The springs were parkerized. Replacement springs were unfinished. 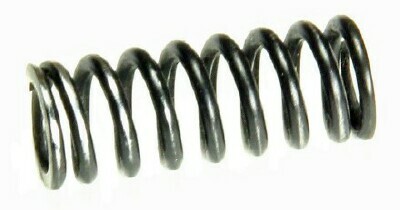 Over time the spring and coils commonly stretched beyond their original width. Replacing the spring requires removal of the rivets and leather cheekpiece. wheel that identified the foundry. The foundry has yet to be identified. All authentic WWII M1A1 buttplates were cast by the same foundry. The M1A1 buttplate below has been found on some of the M1A1's returned to the U.S. Army by Greece. Greece is known to have arranged for the production of replacement stocks for the M1A1. It is absent the sand texture consistent with the sand/resin mold and the number used to indicate the mold position. It indicates part number 6257614. The spoked wheel is absent and in its place is an encircled F.
The B257614 on GI M1A1 buttplates during WWII was the U.S. 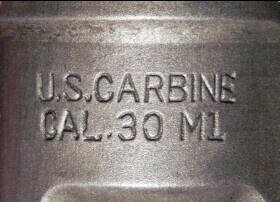 Ordnance drawing and part number used under the U.S. Standard Nomenclature List (SNL). This inventory system was replaced with the U.S. Federal Stock Number (FSN) system in the 1950's. Under the FSN system the M1A1 buttplate designation became 6257614. No documentation has been found to indicate who manufactured this buttplate. However, the encircled F was used by Ferro Machine Company, a subcontractor for Ford, on M1 Garand barrels manufactured circa 1956-57 as well as U.S. Carbine Flash Hiders and Recoil Checks manufactured sometime during the late 1950's and mid 1960's. 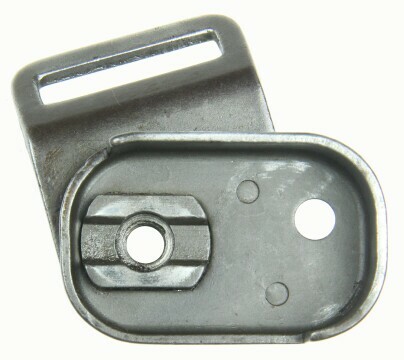 It's possible U.S. Army Ordnance or the U.S. State Department contracted Ferro Machine Company to manufacture these M1A1 buttplates which they provided as military assistance or aid to Greece.